Like many specifically Roman feasts, it began as the dedication feast of a basilica, which in this case is located on the Esquiline hill, within sight of the Colosseum. When a city has more than one church dedicated to the same Saint, they are often distinguished from each other by nicknames; the appellation “at the chains” would therefore serve to distinguish it from the Vatican basilica. Its great antiquity is demonstrated by the fact that it was restored by Pope Sixtus III in the 430s; an inscription which records the restoration mentions that the building was already considered old, and that the Pope re-dedicated it to both Apostolic founders of the See of Rome. The breviary refers very obliquely to a tradition stated more explicitly in the Golden Legend and elsewhere, namely, that the Romans dedicated the month of August to honoring the Emperor Augustus’ memory, and that this second feast of St Peter was created to supplant this holiday. It is true that the Latin names for the seventh and eighth months of the year were originally “Quintilis” and “Sextilis”, and that the Emperor Augustus renamed the former for his adoptive father, Julius Caesar, and the latter for himself. However, it is not likely that the cult of “the divine Augustus” was so vibrant in the mid-5th century as to require serious opposition from the Church. There are 32 days between June 29th, St Peter’s principal feast day, and August 1st; this perhaps suggests the tradition that Peter was bishop of Antioch for seven years, and bishop of Rome for twenty-five, a total of 32 as the visible head of the Church, one less than the 33 years of Our Lord’s earthly life. 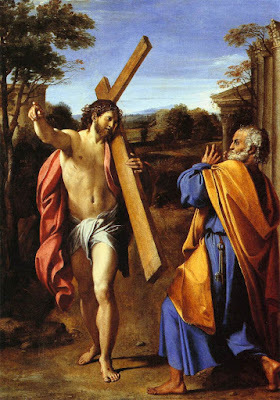 The breviary lessons for the feast day also give the traditional story of the church’s famous relic. When the Empress Eudocia, the wife of Theodosius II, went to Jerusalem in the year 438, she received as a gift the chain by which St Peter was held in prison under King Herod, as narrated in the Epistle of the feast day, Acts 12, 1-11. She then sent it to her daughter Eudoxia in Rome, who in turn presented it to the Pope. 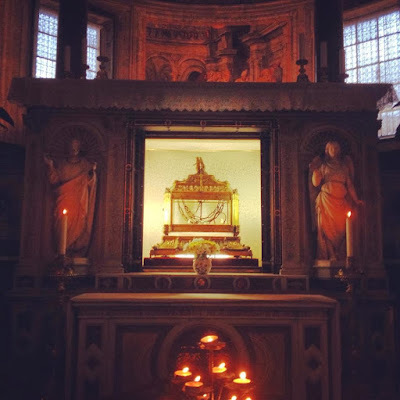 When it was exposed for the veneration of the faithful together with the chain by which Peter had been held during his imprisonment in Rome under the Emperor Nero, the two chains were miraculously united, so as to appear to be a single chain. Photo by Agnese Bazzuchi, from our 2014 Lenten stations series. 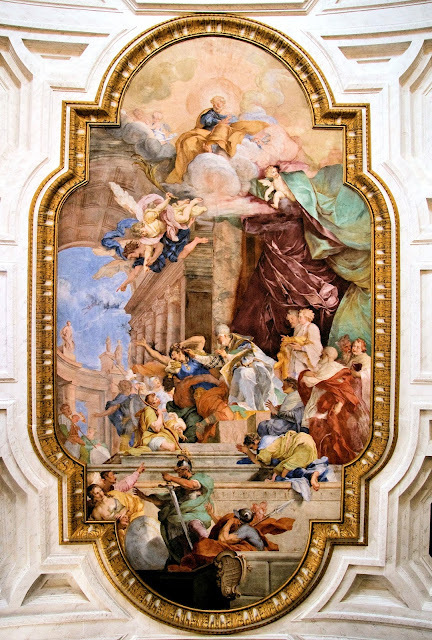 In the year 1706, the painter Giovanni Battista Parodi decorated the basilica’s ceiling with a fresco of a famous miracle attributed to the chains, which is also recounted in the breviary. A count of the Holy Roman Empire was possessed by an evil spirit which caused him to bite himself; when he accompanied the Emperor Otto II to Rome in 969, Pope John XIII placed the chain around his neck, at which the demon was expelled. In addition to the relic and the basilica’s dedication, today’s feast also commemorates the Biblical event of St Peter’s release from prison. The importance of this episode is indicated by the fact that the church of Rome chose the relevant passage from the Acts of the Apostles for the text of both the Introit and Epistle, not only for today, but also for June 29th. We therefore see in today’s feast that St Peter was freed from prison in Jerusalem because his mission was not finished. He was destined to go to Rome, so that he might preach to all nations, “so that the light of truth, which was revealed for the salvation of all nations, might spread itself more effectively through the whole world from its head.” (Pope St Leo I, first sermon of the feast of Ss Peter and Paul.) The Lord Himself sent him back to the eternal city, choosing it as the place to establish the headship of His Church upon the earth, “the first throne”, as stated above in the Byzantine Office of the feast.